I've heard so much about Fahrenheit 451 over the years and I'm so pleased to say that I can totally understand why it's such a well regarded classic. If this were taught in while I was in high school English class I expect it would have easily have been one of my favorites. It really reminds me of 1984 by George Orwell. I wouldn't be surprised one bit if the worlds of Guy Montag and Winston Smith turned out to be exactly the same one. Even Bradbury's novel is a short read, I was fully engrossed in this unsettling and still just as timely as ever. I can only say that I wish we got to see more of the wider world and that we got to see it a little more than we're told about it. I highly recommend this trying this story, there's a reason why it's a classic. I read this on November 19, 2018 and my review is also on Goodreads. I watched this movie adaptation six days after I completed the source material so it was still quite fresh in my mind. To be honest, Michael B. Jordan and Michael Shannon in the lead roles make the movie. They both give good performances as Montag and Beatty respectively. However, though, I do wish that of the two that Jordan's Montag could have been more developed and fleshed out. The opening and first half of the movie are pretty decent. The second half, not so much - the omnis thing didn't work for me, though I did like that through it there is some hope for the future. The movie also modernizes some elements of the story. Some of them worked - and do illustrate just how timely the story still is (and how it doesn't seem all that far off at times), but I overall I would have preferred the subtlety of the source material. Finally, I just want to mention that I was kind of pleased to hear that it's primarily set in Cleveland, Ohio even though it bares no semblance to that real life Ohio city. 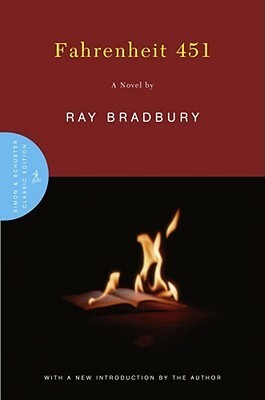 Overall, the movie isn't terrible, but it certainly pales in comparison to Bradbury's book. Michael Shannon is the true standout here. I watched this movie on November 25, 2018 and my review is also on Letterboxd. 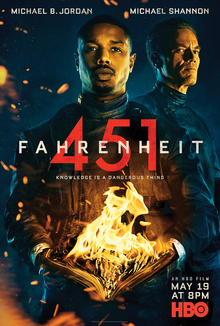 Have you read or watched Fahrenheit 451? What classic book to movie do you still need to try? Are you taking part in Sci-Fi Month this year? As always, thanks for visiting my blog and perhaps even commenting down below! I read the novel back when I was in about 16, and am very hesitant to watch the movie. I don't know if they'll be able to get why the book was so good - there doesn't feel like enough of a storyline for a movie. I absolutely agree - it's all about the subtlety here. I read the novel a long time, but glad you enjoyed the book so much. I don't remember if I have read this or not, so another one for the reading list. I have never read this book! Or seen the movie actually. I've heard the book is quite good, and of course it's a classic, so... I guess I need to get on that! I never read this yet and I bought a copy, looking forward to reading it. Thanks for your review Lauren.